Royal Jelly is a milky secretion produced by worker honey bees and is considered to be among the world's most renowned superfood substances. It gets its name from the fact that it is fed to the queen bee because its multitude of nutrients help the queen bee to live 50 times longer than the rest of the bees in the hive. In fact, the queen eats exclusively Royal Jelly throughout her life. The association with the queen is where the 'Royal' aspect of this jelly comes from. The composition of Royal Jelly varies depending on geography and climate but it typically contains about 60-70% water, 12-15% proteins, 10-16% sugar, 3%-6% fats, and 2%-3% vitamins, mineral salts and amino acids. Prized for its high concentration of nutrients, 100% lab tested Royal Jelly capsules are used in herbal medicine to stimulate the immune system, to reduce stress and to support the maintenance of everyday, good health. Royal Jelly is a very rich source of proteins and contains eight essential amino acids, important fatty acids, sugars, sterols and phosphorous compounds as well as acetylcholine, which is needed to transmit nerve messages from cell to cell. It contains gamma globulin, known to stimulate the immune system and fight off infections. Royal Jelly contains naturally occurring vitamins A, B, C, D and E. It is particularly useful for its B-complex contents, including B1, B2, B6, B12, biotin, folic acid, and inositol. 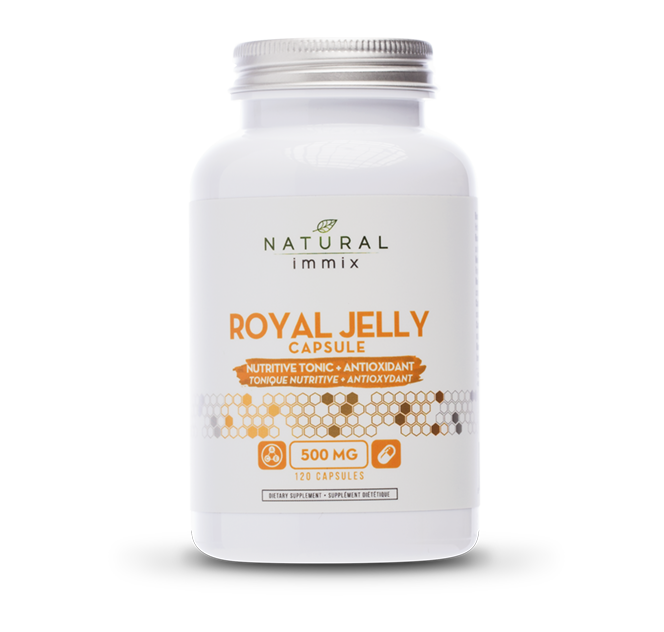 Royal Jelly is also high in the B vitamin pantothenic acid, recognized for its ability to reduce stress levels. Additionally, it supplies the minerals, calcium, copper, iron, phosphorous, potassium, silicon and sulfur.